The New York Women in Film & Television Intern/Mentor Program provides a rare opportunity for people with film/communications degrees and those with entry-level knowledge of the film industry to interact with professionals in the industry and to gain experience under the guidance of NYWIFT members who agree to serve as their mentors. The program is named for Nancy Malone, who made a bequest to NYWIFT to support our programs. Nancy was one of the first women directors in television. She began her career as an actress, worked as an executive and then as a producer and director. In 1976, she became the first female vice-president of television at 20th Century Fox. 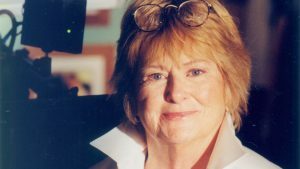 She won an Emmy Award for producing Bob Hope: The First 90 Years (1993) and was nominated for Emmy Awards for directing episodes of Sisters in 1991 and The Trials of Rosie O’Neill in 1992. In 2007, she was inducted as an honoree into the “She Made It: Women Creating Television and Radio” collection at the Paley Center for Media. She was a founding member of Women in Film in Los Angeles. We named our Intern Mentor Program after her because, throughout her career, Nancy never failed to reach down to lend a hand up to the women coming behind her. The NYWIFT internship is a volunteer position. In return for successful completion of the internship, along with being assigned to a mentor, interns receive a complimentary one-year Next Wave membership in NYWIFT. Also, throughout the duration of the internship and for two months after completion, interns may attend all NYWIFT programs and film screenings at no cost. Such programs provide an invaluable opportunity to meet our members and to begin to make contacts within the industry. The program is looking for hardworking, serious, and bright people from diverse backgrounds and with a different experience. Successful applicants are proactive self-starters and college graduates — people who are willing to make the most out of every situation and seek out opportunities instead of waiting for them to happen. Interns agree to work in the NYWIFT office for a total of 45 days. The NYWIFT office is open 10 AM – 6 PM, Monday through Friday (closed on Fridays during the summer). The work schedule can be personalized somewhat to accommodate the needs of the intern but a minimum of one full day per week is required. The internship is usually completed over a 3 – 6 month period, with interns working 1 – 4 days per week. Interns provide clerical support to the organization’s general operations, programs and member activities. Interns also provide assistance at NYWIFT events. As opportunities become available, additional intern responsibilities may include work on other NYWIFT projects, as needed. Time worked is applied toward their 45-day commitment. Interns may attend all NYWIFT programs and film screenings during their internship and for two months after its completion. Programs range from industry-related speakers and panel discussions, to screenplay readings and breakfasts with power players in the industry. Interns are encouraged to attend events as a way to meet NYWIFT members and start making important professional contacts. Mentors are NYWIFT members who not only excel in their careers, but also are willing to share their hard-earned experience with an Intern/Mentor Program participant. NYWIFT members represent every segment of the industry — writers, story development executives, producers, directors, and technicians. A producer mentor may invite the intern to volunteer in her/his office to learn the business first-hand. A script supervisor or cinematographer may train the intern in the basics of the field. A screenwriter may read the intern’s work and offer feedback. The Next Wave Group is an alumni organization open to women who have successfully completed the Intern/Mentor Program. The group shares resources, provides networking opportunities and supports members as they pursue and achieve careers goals. The Intern/Mentor program does not necessarily lead to employment. However, many interns have gone on to impressive careers after their experience in the program. For more information about the Intern/Mentor program please contact Rashiek Smart at rsmart@nywift.org.